America's last surviving veteran of World War I, Frank Buckles, has died aged 110. Mr Buckles, who joined the US army in 1917, at the age of 16, lying about his age to get enlisted, died of natural causes at his home near Charles Town, West Virginia, on Sunday. He was one of more than 4.7m Americans who signed up to fight in the Great War between 1917-18. He served in England and France, as a driver and a warehouse clerk. Mr Buckles was turned down by the marines and the navy for being too young to serve, but managed to convince an army recruiter he was 21. "A knowledgeable old sergeant said if you want to get to France right away, go into the ambulance corps," he said in a 2001 interview with the Library of Congress. He sailed to Britain in December 1917 on board the ship which five years earlier had picked up survivors of the Titanic. "During my stay in England, I drove a motorcycle sidecar, then Ford ambulances and cars. Perseverance paid off and I got assigned to follow an officer who had been left behind from his unit and I got to France," he said. Image caption Frank Buckles lied about his age to join the army. Mr Buckles rose to the rank of corporal but never got closer than 30 or so miles from the Western Front trenches. After the war he helped return prisoners to Germany - and became one himself during WWII. In 1941, while working for a shipping company in the Philippines, he was captured by the Japanese, and spent more than three years in prison camps. After the wars he settled in West Virginia with his family. He remained committed to honouring the 100,000 Americans who had died in WWI and achieved fame as the last surviving link to that conflict in the United States. 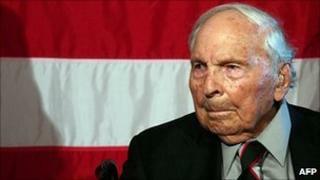 "Frank Buckles lived the American Century," US President Barack Obama said. "Like so many veterans, he returned home, continued his education, began a career, and along with his late wife Audrey, raised their daughter Susannah. We join Susannah and all those who knew and loved her father in celebrating a remarkable life that reminds us of the true meaning of patriotism and our obligations to each other as Americans." In March 2008, Buckles was honored at a special ceremony at the Pentagon and the White House by president George W Bush. In 2009 he travelled to Washington DC to lobby senators to rededicate a memorial on the national mall in honour of the Americans who had fought in the campaign. The Frank Buckles World War I Memorial Act never became law. There are only now two documented surviving veterans of The Great War, 109-year-old Claude Choules and 110-year-old Florence Green, both of whom are British.